Concrete form work has several roles; to shape the concrete being poured, to contain the concrete within a given area and provide a level surface for concrete screeding. The type of formwork required for a particular concrete project is often determined by the volume of concrete the form needs to retain and the pressure or weight that the concrete be applying against the concrete formwork. Typical concrete formwork used for flat concrete work such as concrete patios, concrete driveways, concrete pathways and concrete house slab on ground, range in height from from 6cm to 30cm. Because the majority of the weight of the concrete is spread across a large surface area – this relieves much of the horizontal outward pressure pushing against the formwork. In most cases forms for this size of construction are wood, with metal only being used for larger commercial works. When forming concrete in a vertical orientation such as concrete retaining walls – there is increased horizontal pressure as the concrete formwork is taking the majority of the concrete weight and additional bracing and or metal formwork is highly recommended. Where the edge of the concrete is exposed and is a visual feature – concrete stencilling can be applied to the inner surface of the formwork to create a finished text or pattern. 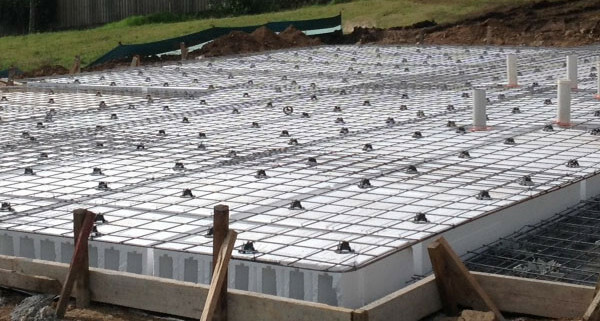 Concrete Formwork is an essential and critical component of any concrete slab. At Thundercrete we take pride in our work and preparation is the key. Call Sam on: 0410 859 829 for a no obligation free quotation on your concrete slab in Brisbane, Gold Coast or Sunshine Coast.